Avalanche warnings have been issued throughout the intermountain west following a heavy snowstorm. Nine to 20 inches of snow was reported Sunday in parts of northern Utah, where an avalanche warning was in effect for the Wasatch Range, Bear River Range and Western Uinta Mountains. Sunday’s heavy snow increases the risk of avalanches in Utah’s backcountry. In fact, three snowmobilers narrowly escaped danger on Friday when they triggered an avalanche in Rocky Hollow near Providence Peak. According to the Utah Avalanche Center, a 300-foot wide avalanche was triggered when a snowmobiler went to help another rider who was stuck. The avalanche broke free just 20-feet below them and descended down a gully approximately 500 feet. According to avalanche observer Toby Weed, the risk for avalanche is already high with heavy, wet snow piling on top of dry, wind-swept snow. 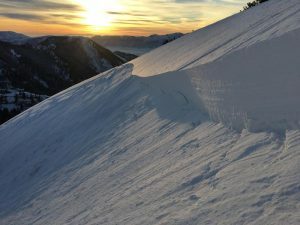 “Soft slab and loose avalanches will become more likely as fresh snow accumulates, even in sheltered terrain,” the Utah Avalanche Center warned Sunday. The center is forecasting HIGH danger on many backcountry slopes Monday.